These may be the best tater tots I've ever had. Yeah. I just said it. 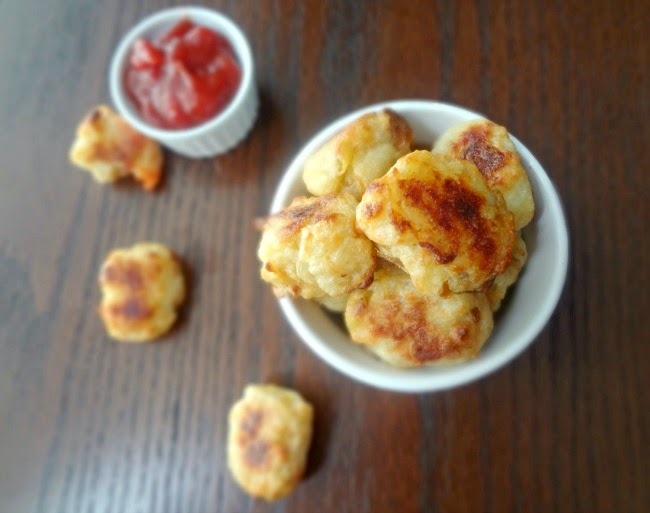 And you know the best part about these AHMAZING (and oh so addictive) tater tots is? They're not fried. They're not breaded. They're not full of gunk. They're just potatoes, deliciously sweet and smoky roasted garlic, and my fave dairy product: Parmesan cheese. And a dash 'o' salt. Oh yeah. Do you want to know the 2nd best part? I got to use my cutie-patootie little baby ramekin. Loooook at it! Cuteness. Seriously though...I couldn't stop eating these. I'm sort of in love. 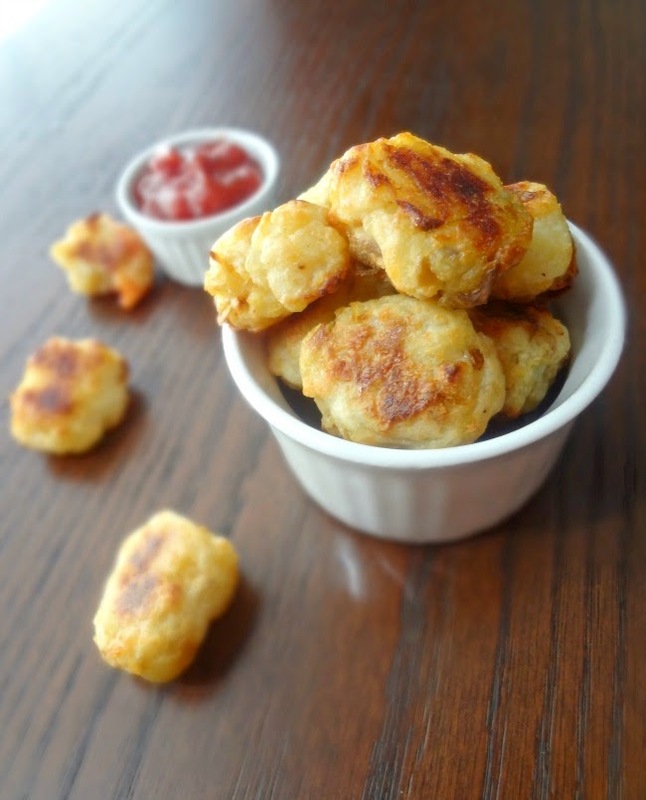 And of all the tater tots that I've made, these might be the EASIEST and quickest too! Even Michael liked them (he said next time he'd like to try them with only potatoes-but at least he didn't say he'd rather have the frozen kind!-SUCCESS!...sorta...I still wanted the garlic and Parmesan....but I guess I could go basic next time ;P). You should make these for yourself, for your significant other, for your mother, for your kids, for your brother (I ate mine before my brother could get to them-that kid is a bit of a mooch lol), for EVERYOOONE. They are total winners! Imagine bringing them to a barbecue, or having them as an after school snack, or snacking on these lovelies whilst watching Netflix on the couch....all are great options. 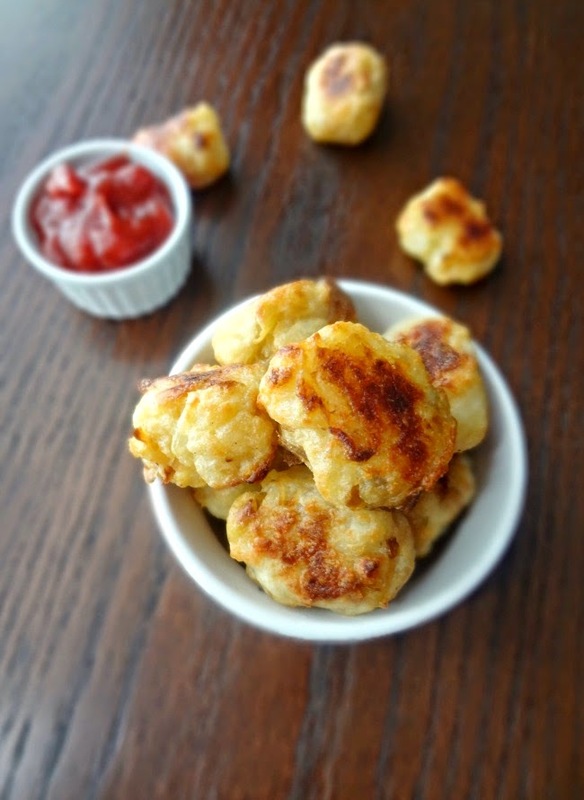 Adapted from Food52's "Hand-Formed Parmesan Tater Tots"
Makes approx. 31 tater tots. Preheat oven to 400F degrees. Scrub potatoes and place (whole potatoes) on a baking sheet. Take 2 cloves of garlic-leaving the skins on-and place in the middle of a piece of aluminum foil. Drizzle with olive oil and twist up the aluminum foil around it. Place this on the baking sheet with the potatoes. Roast the potatoes and garlic for 35 minutes-until the potatoes are fork tender. Remove from oven and increase the oven temperature to 425F degrees. Once roasted garlic has cooled, remove the skin and mash into a paste. Place in the mixing bowl you just used. Using the large bowls of a box grater, shred the potatoes (you may leave the skins on or remove them). Add the grated potatoes to the bowl with the garlic and add the Parmesan cheese and salt. Use a fork to combine everything. Line the baking sheet with a piece of parchment paper. Coat with olive oil. Using a teaspoon (or just your hands) form little 1 inch cylinders out of the potato mixture and place on the oiled sheet. Bake 20 minutes. 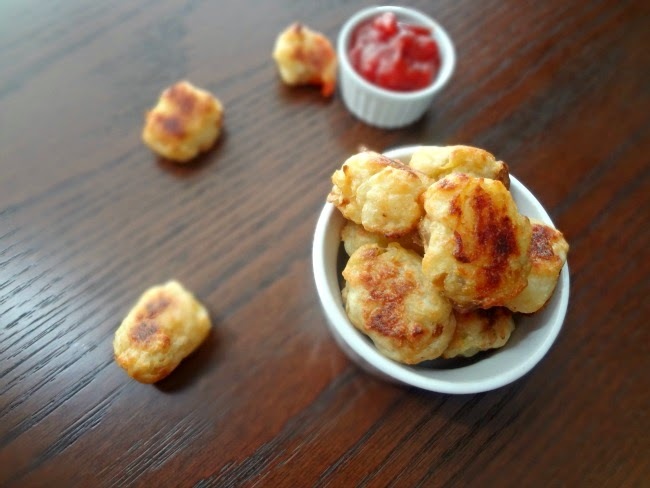 Flip each tater tot over. Bake 15-20 more minutes. Cool slightly and serve hot. Store any leftovers in a covered container in the refrigerator and, to reheat, place in a 350-400 degree oven for about 10 minutes, or until heated through. I also like the crisp outsides and potatoe-y insides.